mention his vocals and computer generated compositions – are at the forefront of post-fusion music. Malik’s performances, ably backed up by his 4-member band, have not only raised the bar to an all-but-unreachable standard for flutists. He is poised to give jazz-making in Europe a confidence it has not known since the days of the guitarist Reinhardt Django. 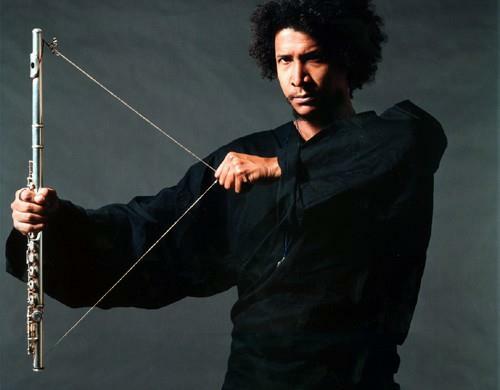 Malik’s greatest gift lies in transmuting sheer virtuosity into exuberant showmanship. The audacity of his ideas, the clarity of his advanced music conception, his execution, and the surging confidence of his attack are absolutely mind-boggling. He and effervescent battery partner Gilbert Nouno often seemed like the jazz equivalent of a tireless duo of gamboling accomplices.Deep keyboard chords and implacable, slow battery grooves (echoing the Miles Davis bands of the 1980s) and tense and anguished abstract vocal sounds set the pace for the whole performance. DJ Oil and Hubert Motteau joined the duo on computer-programmed sound, developing improvisations, harmonic structures and drum rhythms with aid of artificial intelligence. Magic’s darkly reflective music borrows from the Dagbon people of Yendi, who have a tradition of speaking through their music using a drum language that still survives today. The ever-probing flutist collaborates in a creative way with musicians interested in the Yoruba tradition (predominantly from western Nigeria), which incorporates one of the ancient African religions underlying Santeria (Cuba and Puerto Rico), Candomblé (Bahia, Brazil) and Vodun (Haiti). He investigates the ways in which the ideas of these traditions have been transmitted through music and adapts them to his slow vocal sighing. Influenced by the philosophy of ancient cultures and music from West Africa, his music is a sonic symbolic and philosophical language. The key to Malik’s performance lies not so much in the fact that he can leave the crowd breathless with his dazzling flute playing – so full of surprising turns that at times it recalls the mantra-like melodies to the god Pan. It lies rather in his remarkable sense of composition and context, which commands the audience’s attention in the way Louis Armstrong and Charlie Parker – two of his jazz heroes – did before him. Malik’s dance-music beats and harmonies derive from Steve Coleman’s M-base school, in which improvisation is developed within nested looping structures. Above all, Malik seeks to create music from personal experiences, which he expresses with electronic noodling, vocal regurgitations, free form and jerky fluting. The collective talent on the bandstand was immense, and Malik and his group held the crowd’s attention like a magnet. 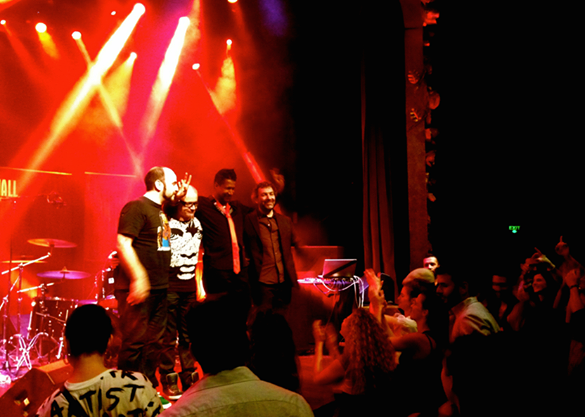 It was undoubtedly the best show in town – courtesy of Karim Ghattas of Jazz Beirut.